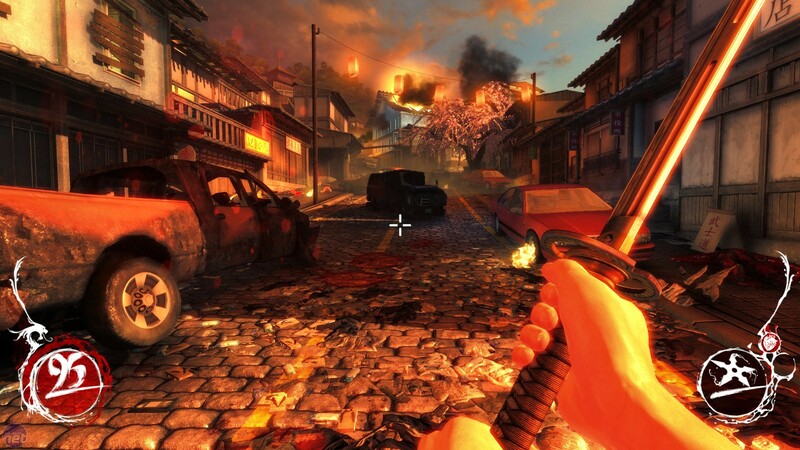 The news that Devolver Digital were producing a reboot of Shadow Warrior met with a mixed response. 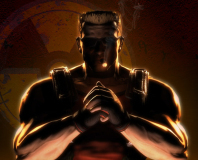 Many were concerned that somebody thought it a good idea to bring back a notoriously racist FPS from the late nineties, and everyone else was simply bemused as to why you'd want to reboot a game that was rubbish in the first place. 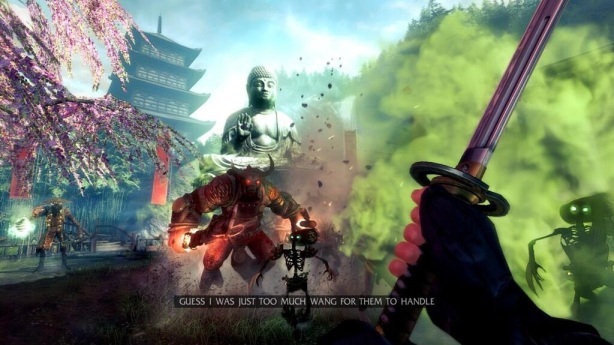 It almost seemed like the new Shadow Warrior was destined to be absolutely terrible, which just goes to show what a load of old tosh the concept of destiny is. 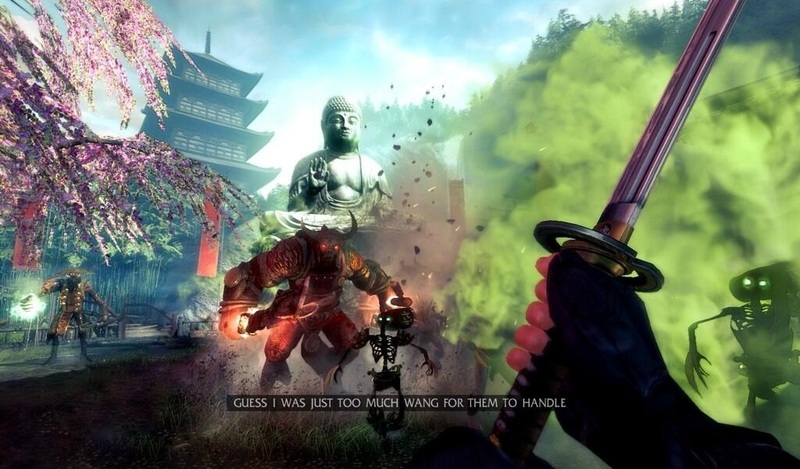 Punch your hand through a wall and sing praises to our random Universe, because Shadow Warrior is a surprisingly well made and extremely generous helping of old-fashioned FPS fun. Well, we say "old-fashioned". A lot of what makes Shadow Warrior such a pleasant surprise is that developers Flying Wild Hog have used the basic premise of Shadow Warrior (which is essentially "Duke Nukem with a horrendous oriental stereotype"), and built their own game out of it rather than chaining themselves to fastidiously remaking a 90s shooter in a prettier engine. Even the "horrendous" and "stereotype" bits have mercifully been jettisoned for the most part. You still play as the uncomfortably named "Lo Wang", battling through an army of demons while hunting for a legendary katana on behalf of powerful gang-lord Master Zilla, and the game still can't quite decide whether it's based around Chinese or Japanese culture. 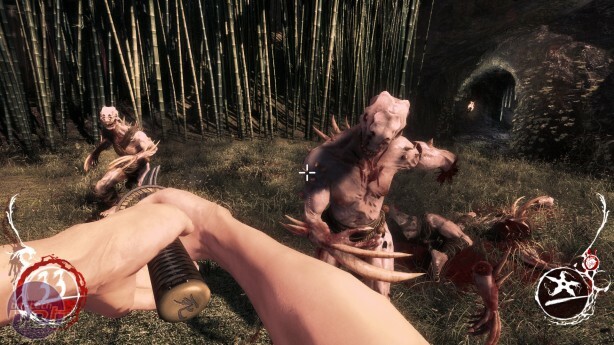 But for its second outing, Shadow Warrior actually bothers to add some character to Lo Wang beyond his name and where he comes from, and it is by and large an entertaining one. For example, he doesn't wander around wielding a katana and throwing ninja stars because he's Asian and all Asian people clearly do that, but because he's a massive comic book nerd. 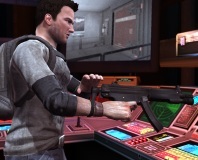 In addition, behind the typical FPS protagonist bravado, there's a slight lack of self-confidence about Wang. 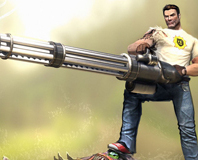 This is demonstrated fairly early in the game, when he pushes a car down a street at a horde of encroaching demons, and mutters under his breath "Please explode, please explode, please explode." We're hardly talking Walter White levels of character development here, but it's enough to keep you involved in what's going on in the moments when the action pauses for breath. 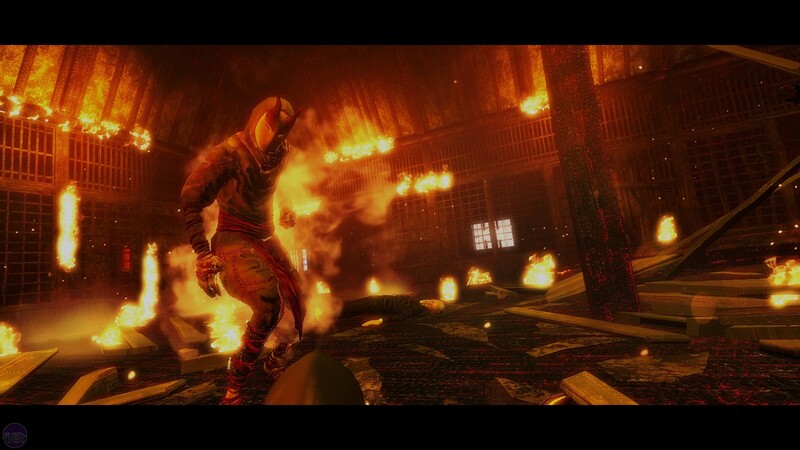 Another way in which nu-Shadow Warrior differs from its source material is it's actually quite funny this time. A lot of the humour derives from Wang's companion, a demon named Hoji, who sounds like a cannier, less trustworthy version of Shaggy From Scooby Doo. They're relationship is essentially the same as that of Jackie Chan and Chris Tucker in Rush Hour 2. Asian martial arts expert meets wisecracking inter-dimensional demon, cultures clash, lots of people die, hilarity ensues. Seriously though, Hoji is an excellent character, and makes up for every time Lo Wang makes a joke about being called Lo Wang, which unfortunately does still happen. Nonetheless, we can forgive the dreadful jokes about genitalia, because there's a game here too, and it's quite a good one. It basically involves carving a path through hordes upon hordes of colourfully designed demons using the generous array of weaponry at your disposal. By far the best of these is Wang's katana, which comes with directional light and heavy attacks, and can be upgraded with three special attacks - a powerful stabbing attack, a horizontal slicing attack, and an absurdly impressive spinning attack.